The Brick Township Municipal Utilities Authority (Brick Utilities) recently completed a series of workshops promoting simple measures people can take to help protect the Barnegat Bay Estuary and Metedeconk River Watershed. Greening Your Landscape While Protecting the Watershed discussed how rain barrels and rain gardens reduce nonpoint source pollution from stormwater runoff to these waterbodies. The free workshops were offered from August 2017 through October 2018 to residents throughout the Barnegat Bay watershed with a grant from the Barnegat Bay Partnership. Stormwater has been identified as one of the primary water quality threats to Barnegat Bay and the Metedeconk River. It picks up nonpoint source pollutants while running over the landscape, roads, parking lots and driveways. By capturing stormwater in rain barrels and rain gardens, less runoff and nonpoint source pollution reach our local rivers, streams, lakes and bays. 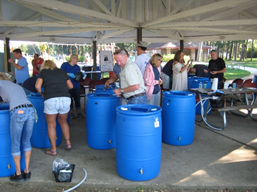 Presentations were given at the beginning of each workshop regarding the benefits rain barrels and rain gardens have in reducing stormwater runoff's effect on local water resources as well as other benefits they provide. Hands-on experiences were given to each participant on how to build and install these measures around their homes and businesses. 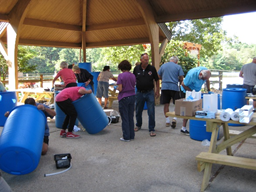 Three rain barrel workshop were conducted at Ocean County Park in Lakewood and Windward Beach in Brick. 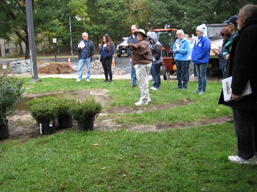 Attendees, after learning the benefits of harvesting rain water to prevent stormwater runoff and using it in their landscapes, learned how to build one and take it home. All materials for construction were provided, as was a demonstration on home installation. One rain barrel can capture about 1,400 gallons of water from April through October. The seventy-five rain barrels that were built and installed by participants will prevent 105,000 gallons of polluted stormwater from entering the Metedeconk River and Barnegat Bay. Rain garden workshop participants learned how they could create beautiful habitats for wildlife within their landscapes with native plants, while trapping litter, debris, sediment and contaminants in stormwater runoff. Everyone learned how native plants and microbes in the soil break down and use pollutants in stormwater. This treated water slowly soaks into the soil, recharging groundwater supplies. Participants were introduced to the Jersey-Friendly Yards website (www.jerseyyards.org) as a helpful tool in water conservation and natural landscaping practices they can use around their homes helping to improve water quality. 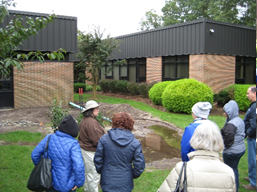 The workshop was held at Brick Utilities offices where a demonstration rain garden was built in various stages of completion so participants could see first-hand how they are constructed. The Metedeconk River is the northernmost major tributary to the Barnegat Bay and main water source for Brick Utilities, which provides drinking water to over 100,000 residents in five towns. Partner organizations for the project included the New Jersey Department of Environmental Protection, Township of Brick, Ocean County Department of Parks and Recreation, and Boating Education and Rescue (B.E.A.R. ).